Aviation enthusiasts of all ages will be flying high when they see the vintage Boeing B-17 Flying Fortress Nine-O-Nine WWII Heavy Bomber, Consolidated B-24J Liberator Witchcraft, the B-25J Mitchell Tondelayo, and the P-51C Mustang Betty Jane, known as one of the greatest piston-engine fighters ever built. The Wings of Freedom Tour will offer participants bragging rights to explore these majestic aircraft inside and out and learn more about these unique and rare treasures of aviation history. 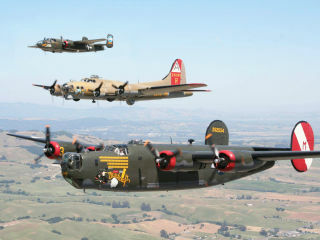 The B-17 is one of only 10 in flying condition in the United States, and the B-24J is the sole remaining example of its type flying in the world.